Pamela Reckamp, Nathan Bush, Donna Weinsting and Jared Sanz-Agero cautiously feel each other out in “Chancers” at Max & Louie. We’re dealing with a U.S. premiere here in Robert Massey’s funny, funny look at life in County Kildare, Ireland as “Chancers” takes a look at ethics versus survival when a winning lottery ticket becomes the prized possession in four people’s fight for the $250,000 grand prize. Intrepid acting and superb direction bring this play to life with snappy (and often rather “blue” dialogue) and a dilemma that never quite gets solved but leaves the audience somewhat to their own devices. 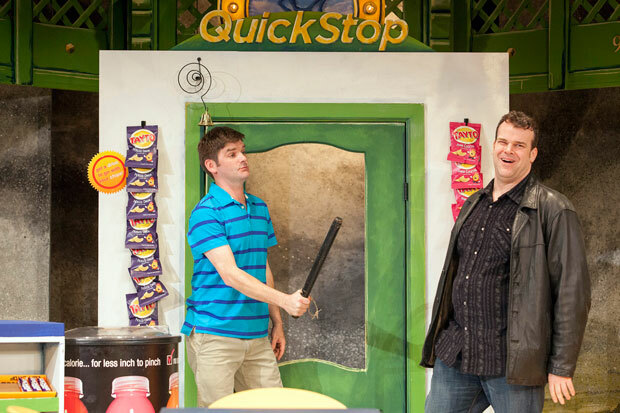 Max & Louie Productions bring us this laugh filled play fresh from it’s Dublin premiere. Aiden and Dee own a small convenience store in rural Ireland and business has not been booming. A blousy, rude and vindictive neighborhood harpy, Gertie, drops in every day to complain and taunt them- letting them know how much better and cheaper things are at the local Aldi and mega store. Her philosophy seems to be “if you can’t say anything nice about someone- go ahead and say it.” Add to the mix a friend of the couple who obviously dated Dee in the past, JP, who becomes the catalyst for family discordance and a nefarious plot that turns the story line upside down. Nathan Bush is excellent as the wishy-washy husband who tries scheme after scheme to pump customer attractive perks to his store. The latest fail is a hot food bar that he’s already shut down as it was losing them money even faster. The delightful Pamela Reckamp is his long-suffering wife who is trying to get some extra money in by going to a job interview as the play opens. You realize that this is going to be another major fail. These two make a wonderful couple who, in other circumstances, would be perfect for each other. 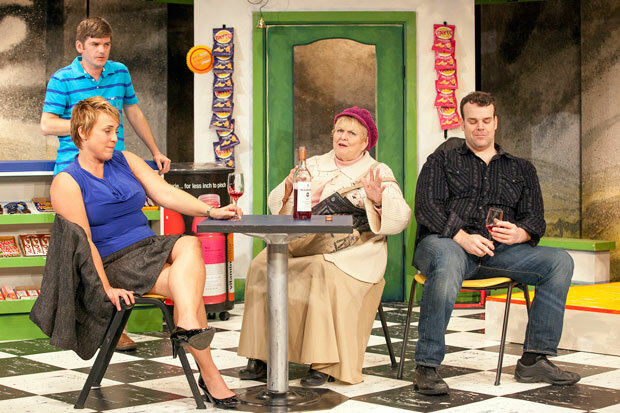 Nathan Bush and Pamela Reckamp settle a disagreement as Jared Sanz-Agero looks on in “Chancers” at Max & Louie. The always incredible Donna Weinsting plays the irascible Gertie who wears her disdain like a letter sweater. She’s proud to be the local Debbie Downer and has a mother’s blindness for her rather perverted son who we never see but get enough info on through his escapades and a very funny yet disturbing phone call with Dee. And she provides most of the “X-rated” dialogue. Jared Sanz-Agero is a ball of fire as the life-long friend who bounces around the little shop devouring their food and drinking their soft drinks while not opening his wallet. 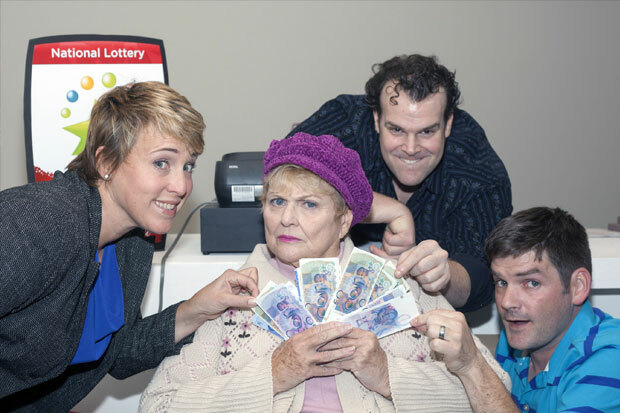 The crux of the plot comes when Gertie asks Aiden to check her lottery ticket and we see from the stunned look on his face that it’s a really big winner. He composes himself and tells her it’s not a winner and tries to throw it away. But Gertie likes to keep her old losing tickets, just in case. When Aiden tells JP about the ticket after Gertie has left, he tries to hatch a plot to mug her and steal it. Aiden won’t go along but when Dee returns after her failed job interview, she agrees with JP but feels they should find a more genteel route to procuring the winning ticket. Through brawls between the two men, the obvious ignored “voice of reason” from Dee and the final confrontation with Gertie, “Chancers” gives us a chance to see the worst in human nature. A hilarious transformation to mugger for JP and the absolutely absurd plans and counter plans are just a wonderful trip for the audience. Sydnie Grosberg Ronga has directed with a frenetic pace that suits the outlandish script. Assisted by a masterful set design by Margery and Peter Spack and the strong lighting design of John Cameron Carter, this plays has the proper feel for the small Irish village. And special kudos to dialogue coach Katy Keating who brings an almost flawless dialect to all involved. This is your last week-end to catch “Chancers” at the Kranzberg Arts Center- it’s all over November 16th. The small crowd on Thursday night when I was lucky enough to see it filled the space with laughs to a well deserved cast. Contact Max & Louie Productions at maxandlouie.com to get more information or buy tickets. This entry was posted on November 14, 2014 at 9:43 am11 and is filed under Uncategorized. You can follow any responses to this entry through the RSS 2.0 feed. You can leave a response, or trackback from your own site.